Keurbooms – Keeping to Saturday’s South African spirit of leaving it to the last second, the SA K1 Marathon Championships saw no less than three brilliant endsprints to the finish line on Saturday. The highlight was the stunning senior men’s race, where the top four boats finished within two seconds of each other. South African sprint ace and 2006 K1 World Marathon Champion Shaun Rubenstein took the line honours to claim the most closely contested national title in years. After the first lap there was a strong four boat breakaway in the men’s race, with Rubenstein, Hank McGregor, Len Jenkins and Ant Stott all taking turns to take up the pull, and looking for any chance to edge each other off the bunch. None of them showed any weakness though and the four musketeers used the 7 laps to put some distance between them and the chasing bunch. Jenkins even overcame an incident on the final portage where he dropped his boat, but he managed to catch the lead bunch and put in a massive effort on the line to take the silver medal. “It was a very competitive race and at no time could anyone be confident that they could win. The other three guys are all class athletes so it was very tactical. I’m so pleased my final portage was good and I had the speed to win on the line,” said the Gauteng champion afterwards. 2003 K1 World Champion Hank McGregor was third and Dusi champion and reigning K2 World Champion Ant Stott fourth. 2007 World Junior Champion Grant van der Walt had a terrible start to the race, but managed to work his back inot fifth place ahead of Lance King who was sixth. The quality of the field was unparalleled and the racing lived up to the highest standards. Well one thing she can expect is a trip with the national squad to Portugal in September for the World Marathon Championships. U23 paddlers Robyn Kime and Abby Adie were third and fourth, five minutes behind the leaders. The Junior Boys race also ended in a dramatic final sprint, with Gauteng protégée Brandon van der Walt taking line honours ahead of Murray Burgess. The two had managed to break away early on in their race, and finished over two minutes ahead of the chasing bunch. The Junior girls race resulted in a more clear cut finish, with KwaZulu-Natal U16 paddler Kerry Segal taking the win almost a minute ahead of Gauteng’s Kerry Malan. Western Cape sprinter Melanie van Niekerck was third a further minute behind. Race conditions were tough throughout the day, with the low tide and gusting wind throwing in another dimension to the competition. The Keurbooms River gorge protected the field for most of the time, but they had to deal with random headwinds and tailwinds, as well as sand banks and shallow water. National marathon Chairman Malcolm Stothard was delighted with the day’s results. “We had to move the portage for the final race because of the sandbanks, but it was a fantastic day of racing, and there was great support throughout,” he said afterwards. The paddlers are preparing for another day of top competition tomorrow, when the K2 racing takes place at the same venue from 9am. Keurbooms – It was a case of the cream rising to the surface during Sunday’s K2 SA Marathon Championships as 2006 K1 World Champion Shaun Rubenstein and reigning K2 World Champion Ant Stott raced to a solid victory on the Keurbooms River. In the senior ladies race, international World Cup champion Bridgitte Hartley and fellow Olympian Michele Eray claimed a comfortable victory. Racing in the overcast drizzle, there was a two boat breakaway from the first portage in the men’s race. Rubenstein and Stott and Hank McGregor and Grant van der Walt dropped three chasers at the put-in, and spent the rest of the seven laps working together to drive home their advantage. “We tried to put pressure on them at the portages, but otherwise we kept up a steady pace on the water in anticipation for the endsprint,” said Rubenstein afterwards. “We felt that we had the speed for the endsprint so we managed to break away on the final straight.” The win by almost three seconds capped a dream weekend for Rubenstein, that included victory in Saturday’s epic K1 race. The ladies race endured its fair share of drama as the pairing of one of the pre-race favourites, Olympians Jen Hodson and Carol Joyce, missed the start of the race. The pair arrived during the second lap, and entered for the final four laps on a time trial basis for selection purposes only. Bridgitte Hartley and Michele Eray were told of the change for the start of their third lap and had to put tactics aside to race against the clock, which they managed to good effect by finishing 19 seconds ahead of Hodson and Joyce. “It’s easier to race with someone so you can share the work, but the race changed after the second lap and we just had to go as hard as we could,” said Hartley afterwards. 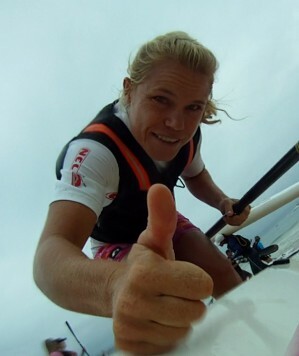 The Gauteng star won Saturday’s K1 event, with Plettenberg Bay local Eray in second, while Hodson and Joyce opted to focus on the K2 event. Earlier in the race, Lindi-May Harmsen and Abby Adie put in a strong charge at the first portage, but traffic at the put-in from an earlier race allowed Hartley and Eray to sneak ahead, and they immediately capitalized by putting in a strong interval on the water to break away. Harmsen and Adie finished over four minutes behind the eventual champions. The Junior races ended in two-boat endsprints. In the boys race, the Gauteng combination of Brandon van der Walt and Murray Burgess, who had placed first and second in Saturday’s K1 race, were too strong for Martin van den Bergh and Stu MacLaren. The U16 boat of Gavin Shuter and Ruan Knobel were just over a minute behind in third. Kerry Malan from Gauteng, managed to kick on from her second place in the K1 race, to partner Jenna Ward to victory in the girls race. The KwaZulu-Natal duo of Lindsey Davis and Jenna Starr were less than a second behind, with K1 junior winner Kerry Segal and Lauren Felgate winning the endsprint for the bronze.